Logan gets pulled back into action against his will in “Old Man Logan”. Wolverine has been taken down a notch. No, scratch that. He’s been taken down so many notches that there just aren’t any more notches left. We don’t understand exactly what has happened to the hero when the story opens. Writer Mark Millar waits until the midpoint of “Wolverine: Old Man Logan” to show us what it is to tear down a hero to the point where there is just nothing left but the shell of a man. When the event occurs, it is clear why Logan has given up the will to fight and the desire to be the best he is at what he does. He wanders off to lead a peaceful life, far from the violence that defined him for the first half of his life. This is a tricky place to start a story when the protagonist is so closely associated with ferocity and the writer is so adept at glorifying violence. But worry not, Millar finds blood to spill and plenty of it over the course of the eight chapters that make up this fun-filled jaunt across a post-apocalyptic Marvel Universe. With “Old Man Logan” Millar has crafted one of the most pleasing Wolverine stories in memory. Millar’s script is light, both in story and dialogue, but the writer has filled each compelling chapter of his blockbuster with a sense of fun and excitement. Whether it’s the appearance of classic characters, offshoots of characters, the writer’s typical brand of self-referential dialogue or blisteringly cool action sequences, Millar dares Marvel readers not to enjoy this thoroughly entertaining story. Anybody interested in good action adventure could get a kick out of “Old Man Logan”, but it’s Marvel enthusiasts who will enjoy the feast of references found herein. Not much of a story takes place as Wolverine and Hawkeye travel across the country to deliver a package in what is, at its core, a buddy road-trip where the two elderly protagonists find themselves constantly knee-deep in adventure. This is more an exercise in which these two find their way out of one scrape and into the next. But a sweeping plot isn’t the point of “Old Man Logan”, a book that aches to entertain readers who are eager for a good time. The true voyage in this story is the internal one that Logan takes along the way. “Old Man Logan” shoots us fifty years into the future where the villains of the Marvel Universe, after a decisive battle, have laid claim to the United States and reshaped it for themselves. Actually, they didn’t so much reshape it as they knocked everything down and renamed it. Here lies Logan, very far from the life he knew before. No rage, no costume, and no more fight left for Xavier’s dream. The former hero is content to his resigned life on a farm with his wife Maureen and his children Scotty and Jade (the old guy is at least nostalgic). It isn’t until Logan is faced with the authorities, a gaggle of Bruce Banner descendants known as the Hulk Gang, that we see just how much mettle old Logan has, and it isn’t much. 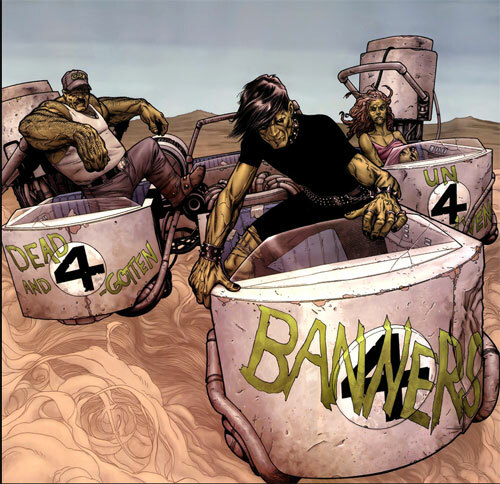 Millar and McNiven gives us the not-so-nice descendants of Bruce Banner. With the setting established the story begins as Logan’s old friend Hawkeye appears with a proposition: deliver a package to the East Coast in two weeks for a $500 payday. “That’s an awful lot of dough Wolverine… and an awful lot of rent,” Hawkeye advises a bruised and beaten Logan. The silver lining in this bleak dystopian future is that a dollar goes an awful long way. And how do a couple of former costumed vigilantes travel from the West Coast to the East? Why they drive a Spider-Mobile of course! In what is one of what seems like a thousand references to former Marvel characters, vehicles and weapons, Spider-Man’s old ride becomes a central part of the story. What is astounding is that Millar is able to take one of the most ridiculous objects of the Marvel Universe and makes it seriously cool. Seriously. With just enough time for a detour, Hawkeye makes a pit stop in Las Vegas to handle some personal business where the two men run into some trouble. This sets the pace for the rest of the story as Logan (he does not at all like being called Wolverine) and Hawkeye (he’s fine with not being called Clint) go from one melee to the next. All the while, to the bewilderment of Hawkeye, Logan is unwilling to either join in any fisticuffs or unsheathe his infamous claws. For the first few chapters, Millar piles on the surviving Marvel Universe references with little restraint. Mjolnir, a Fantasticar, Moloids, Ultron, and the dozens of other characters and artifacts that ought to fill any Marvel Zombie with glee. It’s at the point where Hawkeye demands that Logan tell him why he won’t fight any longer that we are presented with the hero’s darkest day and greatest failure. When all is said and done, Millar has convincingly explained why Wolverine would become a recluse and put the entire mess behind him, knowing that he can never undo the damage he’s done. At one point, a couple of dinosaurs show up and I wondered momentarily if Millar was headed just a tad too over the top. A chapter later he explains in one brief sentence why dinosaurs would be running around the US of A and it makes perfect sense. It’s the Marvel Universe after all and these things do exist. 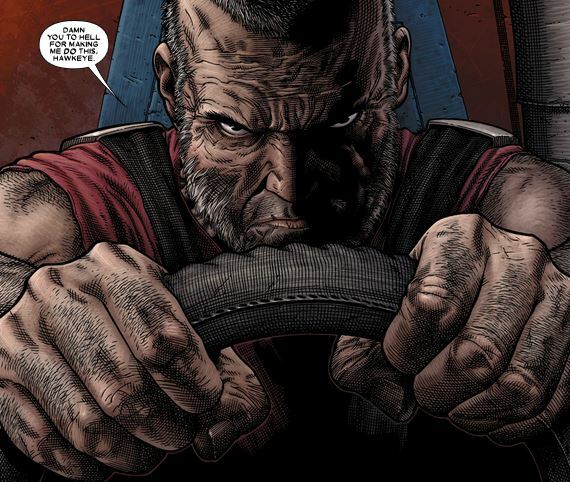 “Old Man Logan” moves along quickly as it remains fairly light on dialogue. Artist Steve McNiven is given plenty of space to reimagine Marvel’s disturbing future. McNiven has his work cut out for him, thanks in part to the aged visages of Logan and Hawkeye who look like a pair of raisins; formidable raisins. It’s the details that are McNiven’s strong suit and he fills his pages with them. From the opening where we begin with the defeated Wolverine disappearing into the forest, to the poetic closing bloodbath, McNiven carefully renders each panel with satisfying detail. Above all, McNiven knows when to pull the camera back enough to address the blockbuster sense of Millar’s story. One astounding double page spread, and perhaps the most memorable images from the book, features the mountainous corpse of Hank Pym sprawled across Connecticut. Millar is a showman and he knows how to grab a reader and keep that grasp tight. “Old Man Logan” is a big, loud, violent tale which aims to please readers and does so successfully. And if I can be frank, I really can’t recall the last time I read a book where I continuously stopped to exclaim “that’s so #@!%$ cool!” Perhaps this is the highest praise I can give this book.